He is accused of continuing to sail despite knowing that the number of passengers on the ferry far exceeded the 100 listed on the manifest. 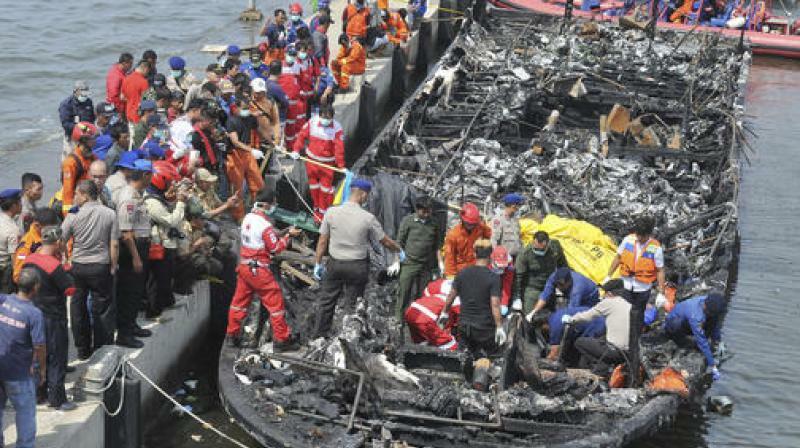 Jakarta: The captain of an Indonesian tourist ferry that caught fire on New Year's Day was arrested on Tuesday for alleged negligence in a disaster that left at least 23 people dead, police said. The Zahro Express was carrying at least 247 people, mostly Indonesians celebrating the New Year's holiday, from Muara Angke port in northern Jakarta to the resort island of Tidung when it caught fire Sunday. A total of 224 passengers were rescued and 23 bodies have been recovered. Seventeen people are reported as missing. The vessel's captain, Mohamad Nali, was detained for questioning following the incident and was arrested on Tuesday, said the chief of Jakarta Maritime Police, Col. Hero Hendrianto Bachtiar. He is accused of continuing to sail despite knowing that the number of passengers on the ferry far exceeded the 100 listed on the manifest, Hendrianto said. Nali, 51, could face up to 10 years in prison if convicted. The chief of the Muara Angke port authority has also been removed from his post for alleged negligence in overseeing the voyage. A search for the missing continued Tuesday, but officials have not ruled out that those reported missing could be among 20 bodies found inside the ship that were burned beyond recognition. The cause of the fire is still not clear, though authorities suspect that it was caused by a short circuit in the engine room.